In this photo from the collection of Karole Rispoli, a young Ferron Bell is pictured with one of his artworks. An exhibit of the late artist’s work, presented by Key West Art & Historical Society opens with a special reception from 6:00-8:00pm on Friday, December 7 in the Bumpus Gallery of the Custom House Museum located at 281 Front Street and runs through February 10, 2019. Key West Art & Historical Society celebrates the legacy of one of the island’s most clever visual artists with “Art & Puns: The Whimsy of Ferron Bell”and a special opening reception from 6:00pm-7:00pm on Friday, December 7 in the Bumpus Gallery of the Custom House Museum located at 281 Front Street. The exhibit runs through February 10, 2019. The exhibit spotlights the quirky late artist’s trademark visual wit and whimsy, featuring work from private Key West collectors, personal photographs, and newspaper clippings about the unique personality widely known for his off-the-wall and humorous creations. 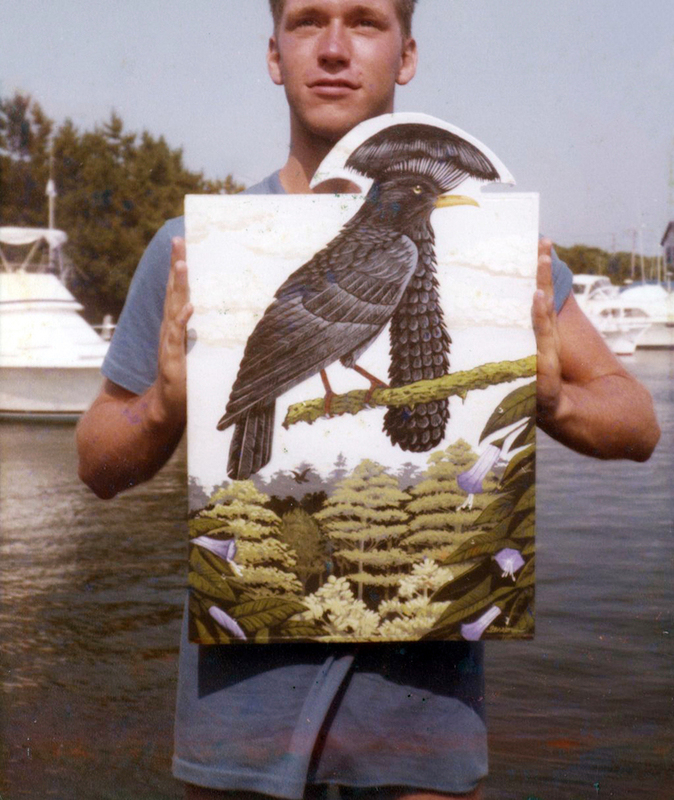 A self-taught artist, Thomas Ferron Bell began his career at the age of 16 in Chattanooga, Tennessee, moved to Fire Island Pines, New York when he was 21, later splitting his time and talents between there and Key West, Florida. Bell worked full time as an artist, cultivating his audience and frequently bartering and donating his work to fundraisers in the Key West community. That said, Bell had a self-professed love of palm trees and made them the subject of his final Key West exhibit – “Palm Sunday Show” – held on April Fools’ Day, 2012, a year before his death. The three-hour pop-up held at Smokin’ Tuna Saloon was a benefit for The Sister Season Fund and the Gay/Straight Alliance at Key West High School, and (by his account) the largest collection of his work ever gathered for one show. True to his wit, paintings included a palm tree with its top shaped like a hand (“Palm Tree Dee”) and feather dusters flanking a lighthouse in lieu of feather duster palm trees (“Lighthouse Keeping”), among many other pun-inspired paintings. Bell’s passion and creativity were embraced by both of the island communities where he lived and worked. In Key West, he was commissioned to paint entire rooms with tropical motifs and sold many of his pieces to friends who supported his quirky vision and nature. The Friday, December 7 opening event for “Art & Puns: The Whimsy of Ferron Bell” is open to the public with a suggested donation of $10 for non-members and free VIP access and reception from 5:30pm-6:00pm for Society members. For more information, call Cori Convertito, Ph.D. at 305-295-6616 x 112 or visit kwahs.org.